I love to bake and I love sharing my baked goods with others. What I don’t love though, is having to hold off on the tasting until I see my family and friends. I so dislike the waiting that I have been known to whip up more than one of something, just so I can enjoy a slice or two ahead of time. Of course, this leads to me consuming far too many treats (not that I’m really complaining). I've always thought that there must be a better way. Little did I know that there is a gadget made just for this type of conundrum. The Nibble cake pan is the perfect solution for all the premature dessert tasters out there. 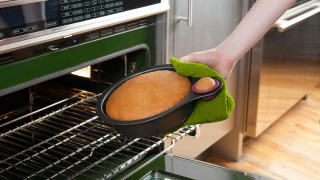 The non-stick pan is much like other cake pans, but with one genius addition. Off to the side it holds a small tasting cup so that you can bake up a bite size morsel to sample without tipping off your guests. 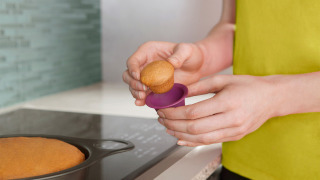 Nibble is an 8” round cake pan with a mini silicone cup held in a hole on the side of the pan. The cup slips out for easy cake testing. Nibble was invented for Quirky by jewelry designer Talia Weiner and is now available to buy.